All the news that’s fit to blog about. See what SAM’s PR Manager, Rachel Eggers, has been reading to find out what’s happening inside the museum and around the art world. For Crosscut, artist and writer Don Fels asks the question: “What has made Yayoi Kusama the hottest ticket in Seattle?” Don’t miss the fun time lapse video from the lines outside the museum (if only they had gone that fast!). Last week, SAM announced the five artists selected as finalists for the 2017 Betty Bowen Award, which honors a Northwest artist for their original, exceptional, and compelling work. The Stranger shared the news, along with Hyperallergic, Artnet, Artdaily, and The Skanner. Stay tuned for the announcement of the winner in mid-September—and for the winner’s solo show at SAM in April 2018. The Stranger, Seattle Met and Crosscut also recommended the event; for those who missed it, helpful Instagrammers captured a bit of the evening’s magic. Where’d You Go, Cate Blanchett? She and director Richard Linklater were spotted filming their adaptation of a famous Seattle book at the Central Library this week. Coming soon to the airwaves of Rainier Valley: KVRU 105.7 FM, a low-power FM station serving the community. The Mayor’s Arts Award winners were announced last week; CityArts reported from the sunny ceremony at Seattle Center. MoMA curator Sarah Suzuki and illustrator Ellen Weinstein teamed up to create a children’s book starring Kusama as the heroine. Prepare for the film/art connections to be explored in Andrew Wyeth: In Retrospect with this Artsy round-up of 17 artists and the films that influenced them. The perfection of style: The New York Times files this inspiring slideshow of street style from the recent Afropunk Festival in Brooklyn. The project that’s achieving “a sense of shared destiny and common civic purpose” with one of my favorite things: LISTS. 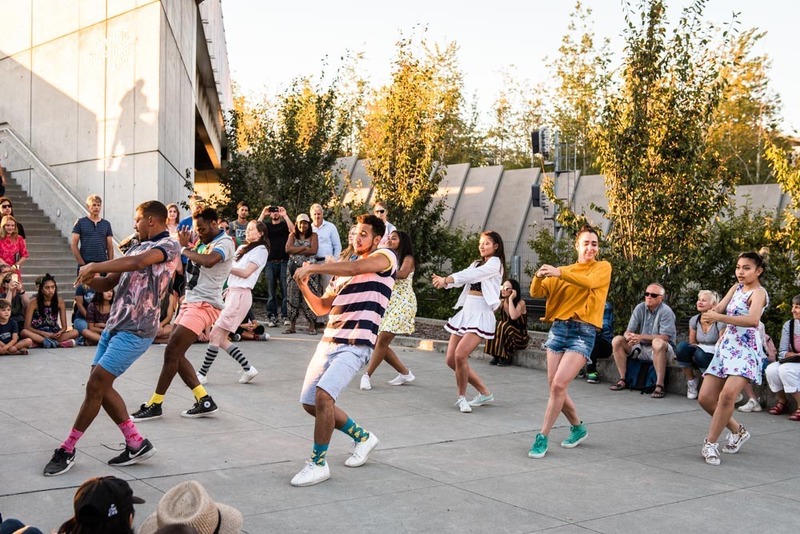 Image: A pop-up performance during Summer at SAM by The Purple Lemonade Collective during Sculptured Dance at the Olympic Sculpture Park on August 31, 2017. Photo: Robert Wade.